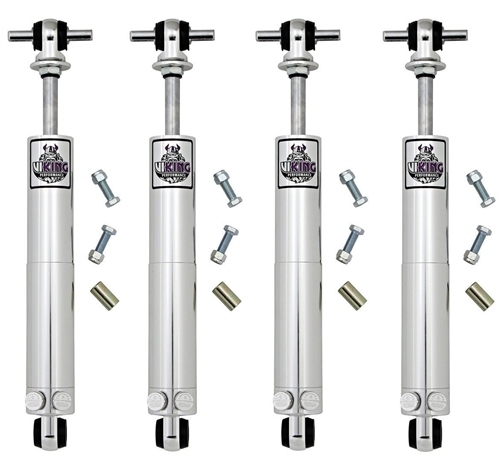 Viking Performance smooth body double adjustable shocks for your 1966 - 1967 Chevelle. Great for comfortable cruising, high performance handling, drag racing, and everything in between! 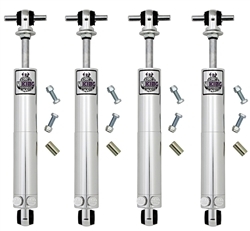 These 66 - 67 Chevelle shocks give you 19 positions of compression and 19 positions of rebound for a total of 361 different valving combinations. Every shock is dyno tested and serialized and hand built in the U.S.A. at Vikings Lakeville, MN facility. They feature lightweight aluminum body with a clear anodized finish, precision machined pistons with PTFE | bronze piston wrap and 5/8" centerless ground, hard chrome plated piston rods. Each shock is covered by a Two year material and workmanship warranty! Double the warranty of nearly every other manufacturer. ~~SOLD IN A COMPLETE 4 PIECE SET, (2) Front and (2) Rear! !